This is not a cookbook that I normally would buy. Don't get me wrong, there's absolutely nothing wrong with it and I actually quite like it. Keep reading and you'll find out more about it and also why I normally wouldn't buy a cookbook like this. 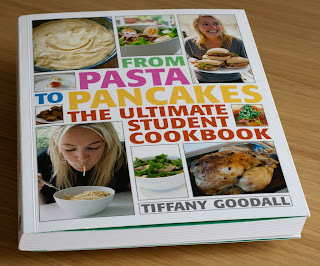 From Pasta To Pancakes - The Ultimate Student Cookbook is written by Tiffany Goodall, you can find her on Twitter. She's fresh out of university and decided to write a cookbook for students. The cookbook itself takes a quite fresh approach to the layout of a cookbook, each recipe consists of photos made out into a cartoon-strip design. This design makes it easy to follow the recipe steps as well as get a view of what the end result should look like. It starts out with some great tips for the fresh/inexperienced cook when it comes to what equipment and store cupboard essentials that you need as well as very good advice on how to avoid giving you and your friends food poisoning. There are over 90 recipes with over 750 photos. The recipes range from cheese on toast to the perfect roast chicken. All recipes have been divided into different chapters, for example Breakfast with Tiffany, Food on the move and Wasted weekends. Why wouldn't I go and buy this cookbook? Well, it's mainly down to me being a bit of a snob when it comes to cookbooks and I would probably not be looking in the beginner/student cookbook section to start with. Would I go and buy it now, after having a chance to review it? Read on and you'll find out. I think this is actually quite a gem of a cookbook, especially for beginners. The recipes are clear and easy to follow and you'll end up with some great food that you have cooked yourself. Anyone using this cookbook will end up eating better and cheaper food than if they went for takeaways and frozen meals. Mikey says: Buy this book if you are a beginner to cookery or why not as a gift if you are sending someone off to university and you want to try and give them a good chance of managing to cook for themselves. I for one will recommend this cookbook to all the people who ask me where to start when it comes to cooking. A big thank you to the kind people at Quadrille Publishing who sent me a copy to review. Thank you for this insight. Now I know what to give those who ask me how to cook, haha. Glad you liked the review and I think you won't go much wrong if you recommend this book. Mike, thanks for stopping by my blog. Forgive my ignorance, but what does catering a "barbie" mean? I'd love to know. Mike, thank you so much for getting back to me. I love the "slang". Barbie...BBQ, cool. Hej vilken fin blogg du har,ska läsa ikapp nu! Tackar sa mycket! Jag hoppas att du hittar nagot som du gillar i tidigare poster. Good review though - nice and balanced! Thanks for the kind review of my review. Excellent Review! Is it available in the UK? It's just about to be released I think, at least according to Amazon.